Looking for the perfect food to tie your whole barbeque together? Don’t forget about summer’s favourite side dish; Coleslaw! Coleslaw is a cabbage salad, typically consisting of cabbage, carrots, vinegar and mayonnaise. It pairs well with summer favourites like hamburgers and other barbequed foods. We can thank NYC deli owner Richard Hellmann's creation of the well known “Hellmann’s Mayonnaise” which he began marketing in 1912. 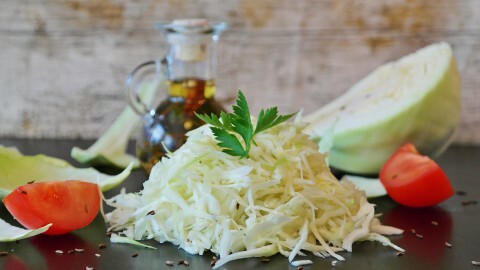 It rapidly became a bestseller, used as a quick and easy dressing for shredded cabbage, which thereafter became a standard side dish to the increasingly popular sandwiches and hamburger dishes. Coleslaw has the potential to be healthy, however most recipes pack on the calories with the use of mayonnaise. Try our No-Mayo Coleslaw for a lighter version of everyone’s favourite summer side dish! It’s a great dish to feed your kiddies because the main ingredient, cabbage, is rich in phytonutrient anti-oxidants, and also contains minerals like potassium, manganese, iron, and magnesium. No-mayo coleslaw is the perfect way to gain all the health benefits of cabbage without worrying about the unnecessary fat content of mayonnaise. For our recipe, all you need is ¼ small red cabbage and ½ small green cabbage thinly sliced, ½ carrot shredded, zest of ½ a lemon, ¼ cup of lemon juice, ¼ cup of olive oil, 1 tablespoon of honey, 1 teaspoon of salt and ¼ teaspoon of black pepper. Toss all ingredients together in a bowl and serve immediately for a tangy salad! If you’re looking for a slaw that tastes more pickled, store in the fridge overnight. If you’re really a fan of a mayo based cabbage but are eager to enjoy a healthier version, you can also try a Greek yogurt coleslaw! Mix together ½ cup of non-fat plain Greek yogurt, 3 ½ tablespoons of cider vinegar, 2 tablespoons of sugar and salt and pepper to taste. Add 6 cups of thinly slices cabbage and toss well. Cover and refrigerate for at least an hour. No matter what type of coleslaw you choose, you can’t really go wrong with this delicious side-dish! Top it on your hamburger, hotdog, deli sandwich, or enjoy it as a salad! Let your kiddies in on the fun and pre-cut the cabbage or buy it already shredded and have them prepare the dish themselves, all they need to do is toss all the ingredients together!